Update: This giveaway is now closed. Congratulations to the winner, Mary Sharp, and thanks so much to all who entered the giveaway! FYI: There’s still time to order Mommy, What Is Celiac Disease? 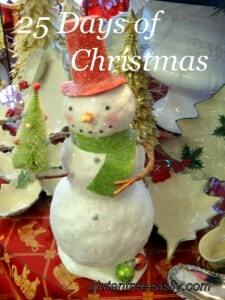 for Christmas arrival via author/illustrator’s, Katie Chalmer’s, website. You can read a recent article on Katie and her terrific book here. I am so honored that Katie Chalmers, the author and illustrator of the unique new book, Mommy, What is Celiac Disease?, asked me to participate in the Gluten-Free Holiday Giveaway Galore x 10 event. It’s a giveaway of a signed copy of her book as well as a terrific gift package featuring gluten-free products from favorite companies and some fun and sweet surprises for kids. I just had to join in! First, I have to tell you that Katie’s book is beautifully written and illustrated. Written for children who have been diagnosed with celiac, it focuses on the disease in simple terms as well as all the wonderful real food that those who are gluten free can eat. Of course, I don’t need to tell you that I love that approach. That’s the gluten free easily—gfe—way, and it works. Along with the text, Katie has created some truly captivating illustrations. I’ve never seen any others exactly like them before. Both Katie and her daughter have celiac and the character in the book is modeled after her daughter. 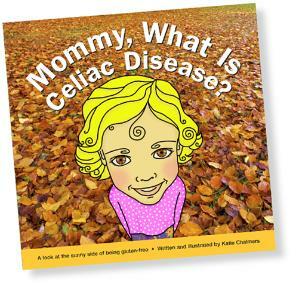 -Signed copy of Mommy, What is Celiac Disease? Note: Contents may vary slightly. • All 10 giveaways are open to residents of the USA. My giveaway and Devan’s (Accustomed Chaos) will also be open to Canadian residents. • Giveaways begin today—Wednesday, December 1, 2010—and end on Wednesday, December 15, 2010, at 10pm EST. • Entry requirements will vary between bloggers. Please follow the individual blogger’s directions to participate. • Entrants can only win once total within all 10 giveaways. If anyone is chosen more than once as a winner, another winner will be chosen so everyone only wins once. • One winner per household. • If any of the 10 prizes do not arrive before Christmas because of any unforeseen holiday mail rush problems, the USPS, Katie Chalmers and hosting bloggers will not be held accountable. There are numerous ways to enter this giveaway. You only have to do one to enter this giveaway, but feel free to do as many as you like. Just be sure to leave a separate comment for each to ensure they get counted! ~Leave a comment saying why you’d like to win this giveaway. ~Post about this giveaway on your blog or share it on Facebook. Leave a comment here saying that you did. ~Tweet about this roundup/giveaway using @Shirleygfe. Leave a comment here saying that you did. ~Subscribe to gfe via reader or email. Leave a comment here saying that you did. ~“Friend” me on Facebook. Leave a comment here saying that you did. ~“Like” Mommy, What Is Celiac Disease? on Facebook. Leave a comment here saying that you did. ~Follow me on Twitter. Leave a comment here saying that you did. ~Follow Katie on Twitter. Leave a comment here saying that you did. ~If you follow (Twitter) any of the other bloggers who are participating in this event (see listing below), leave a comment for each. ~If you “like” (Facebook) any of the other bloggers who are participating in this event (see listing below), leave a comment for each. For additional chances to win, please visit the other participants who make up the “x 10” of the Gluten-Free Holiday Giveaway Galore x 10. (Direct links to their giveaway posts are included below.) This listing includes some of my very favorite blogs and blogging friends, plus a few others who are new to me. I can’t wait to get to know them better! Final note: You can find this event and others on Katie’s Happenings page on her site. I would love to win this contest because I live in a fairly rural area and gluten free products are not readily available. I am always hesistant to buy them online because I’m afraid I wouldn’t like them. This is the perfect way for me to try them. Thanks. I agree on trying gluten-free products. While I use very few of them with my gfe approach, it’s nice to find a few that one can rely on and enjoy. I know you will love Katie’s book, too. Often a book intended for children is a great way to explain the need to eat gluten free to anyone you know. Best of luck in the giveaway! I posted a link to this contest on my Facebook wall. I “friended” you on Facebook. I “liked” Mommy, What is Celiac Disease on Facebook. I “liked” Gluten Free Betsy on Facebook. I “liked” Accustomed Chaos on Facebook. I “liked” Adventures of a Gluten Free Mom on Facebook. I “liked” Be Free For Me on Facebook. I “liked” Gluten Free Easily (GFE) on Facebook. I “liked” Gluten free is life on Facebook. I “liked” Simply Sugar & Gluten Free on Facebook. I “liked” Gluten Free Taste of Home on Facebook. Would be so filled with holiday cheer if I win this great prize!!! Convenience foods are a rarity around here. I love this giveaway because it is something i can give to my 4 year old to feel special. She usually gets left out of fun giveaways and this is something designed especially for her!! Hi Lesli–It looks like this is your first time commenting on gfe–I’m so happy to have you here! 🙂 Yes, winning this giveaway would be a delight for your daughter. I liked “Mommy, What is Celiac” on FB. This pack would make my life over the holidays so much easier! I would LOVE it to educate my family and show them that GF does not taste awful like they assume! I “friended” you on Facebook. This is a great prize and I would like to win so that I can share the goodies with my Celiac group. Hi Johanna–I love how you are always thinking of your celiac group! 🙂 Thanks for the new friendship on FB! Hi Elizabeth–Great to see you again! 🙂 Oh, you made me chuckle on the roasted chickpeas … they are so addictive, aren’t they? 😉 Thanks for reminding me to add some (okay, a LOT … LOL) to my grocery list! Good luck to you on the giveaway! Katie had definitely put together a deligthful prize package. thank you for all you have been doing for each of us. I signed up for the emails and looking forward to reading them! Hi Judy–This looks like your first time commenting here at gfe–welcome! And, what a sweet comment, too. 🙂 Thanks so much for the subscription and your very kind words! I’d love to win because my 5yo son was recently diagnosed as gluten intolerant and we need all the help we can get! I would love to win this giveaway because I work at an early intervention program that provides services to kids with developmental disabilities, many who are GF due to autism or celiac/gluten intolerance. I am gluten intolerant, and I know it’s hard enough to deal with eating GF as an adult. I always feel really bad for the kiddos that have to deal with it, and many families that live in this rural area are low income and don’t have access to transportation to get food at the nearest Sprouts or Whole Foods which are 40 miles away. I’d love to give this to a family who really needs it this Christmas! Thanks for your hard work in this arena, plus all your entries. Best of luck to you! Hi Marcie–Looks like you’re new to gfe–welcome! 🙂 Thanks for the FB connection and best of luck! Hello, I would love to win this for my son, this will be our first GF and Dairy Free Christmas for my son. Many of the products are not available where I am and I need to travel about 5 hours to find some of them. Hi Tracy Mc–So good to see you again! 🙂 Hope you’ve been doing well with gf/df the last several months. This package would definitely be fun to win … good luck! Oh what fun! I’d love to win since there are some products I’ve never tried before. Trying new things is always fun. Thanks for entering the giveaway–good luck! All fingers and toes crossed for this! I’m recently diagnosed with celiac and live in an extremely remote area (I drive 30 miles to a tiny store with few gf options, 250 to a “real” store). I would love to try these! I would love to win this to give to my friend Gina, whose son, has had a neuroblastoma, before he was diagnosed with celiac disease. I’d love to win this giveaway! 🙂 I drive an hour to get my GF products at a decent price. I’d love to win this because I am newly diagnosed and still learning about all the products available. Hi Kristen–Looks like you are new to gfe as well as being new to gluten free–welcome! 🙂 Thanks for entering the giveaway. Hope you’ll take a look around gfe and see my approach which focuses on real food that’s naturally gluten free (plus healthier and more economical), some mainstream processed foods, and some gf specialty products like those in this giveaway. Hi Kathleen–Nice to see you again. 🙂 Thanks so much for your entries! I “liked” Mommy on Facebook. Hi fena–Welcome to gfe! 🙂 Thanks for entering the giveaway … good luck to you! I would to win because as a fairly new gluten free dieter the hardest things for me has been finding things that taste good and recipes. I like Mommy, What is Celiac Disease on Facebook. @ses1978 is following you on Twitter. @ses1978 is following Katie on Twitter. I am following Accustomed Chaos on Twitter. My newly diagnosed ten-year-old daughter would really appreciate winning a bag!! It has been more difficult for her to adjust to a gluten-free diet than watching her carbohydrates for Type 1 diabetes! She doesn’t know any other children with Celiac. Hi Karen–Welcome to gfe! This would be a great package for your daughter, especially Katie’s book. 🙂 Yes, dealing with celiac and Type 1 diabetes at the same time can be challenging. I have some recipes using almond flour and coconut sugar, which are both low glycemic. Other recipes can be adapted to use both. Best of luck with everything, including the giveaway! I am following Adventures of a GF Mom on Twitter. I am following Gluten Free Taste of Home on Twitter. I am following Gluten Free is Life on Twitter. I like Accustomed Chaos on Facebook. I like Adventures of a GF Mom on Facebook. I like Gluten Free Betsy on Facebook. I like Gluten Free Taste of Home on Facebook. I would love to win this for my 2 year old son, who was just diagnosed with Celiac! Hi Sarah–It looks like you are new here–welcome! 🙂 This would be a lovely gift package for your daughter. I would like to win because i just had a 2 month old baby that i will have to explain celiac disease to someday. Hi Denise–Good to see you again! 🙂 This would definitely be a wonderful book to add to your bookshelf for sharing with your daughter in the future. I’d like to win this because it would enable me to try new things for a healthier way of eating. I would love to win this contest, I’m only a year into my gf diet and would love to try some new products! Hi Erin–Welcome to gfe! 🙂 Congrats on being one year gf, and good luck in the giveaway! I have also followed accustomedchaos on twitter! I would love to win this for my 2 year old niece who has Celiac Disease. This book would be perfect for her! Hi Missy F.–Welcome! 🙂 You’re right … this would be a perfect book for your niece. I would love to win this giveaway because my 17 year old son is getting ready to leave for college (!) and I would love to send him off with a basket of safe and delicious treats! Hey Liza–Welcome to gfe! 🙂 So glad you found your way over from Cinde’s blog recently. Thanks for all the entries … good luck! Hi Sue!–Welcome. 🙂 Thanks for the tweet entry! Thanks, Betsy. 🙂 It’s such a fun event! I want to win for the treats. I’ve never tried the Milly products before. I shared information on your giveaway on Facebook, and I also “Liked” Mommy, What is Celiac Disease? on Facebook. What an exciting opportunity! Too fun! Hey SunnyB–We’ve connected elsewhere, but it looks like it’s your first time commenting here … welcome to gfe. 🙂 Thanks for all the entries, and good luck! I liked “gfe” on facebook and added you as a friend. I would also love to win this because I love being able to try new products. Being a crazily poor medical student it is very hard for me to “try” new GF products. With little time on my hands to make meals from scratch, this prize package would be a great opportunity to try new products that I could use in the future! Thank you! I ‘liked’ Mommy, What is CD? on Facebook. I also sent it to be posted on our blog for the Portland Metro GIG (Gluten Intolerance Group)branch. We are re-starting a kid’s group and this will be a nice resource for the parents. I like “Mommy, What is Celiac Disease?” on Facebook. What a very cool idea! I hadn’t seen that children’s book either. Very neat how many special diet kids books are popping up. Thanks for the giveaway! I’d like to win because I’m gluten intolerant who is on a very limited budget. I am tired of eating brown rice and these foods luck fun and different! I’m a facebook fan and subscribe via email. I am fairly new to the gluten free thing and am supposed to be working my kids into gluten free as well. I would love a package like this to show them (and myself) that there is good food out there without gluten in it. Thanks! It would be awesome to win this book and gift package. What a lovely Christmas gift idea! Great giveaway, Shirley. I subscribed to your blog “gfe” via e-mail. I would love to win this. My dd is gf and will not try new things much. This will help to try new things and have stuff in the cabinet that she said no thank you to. I would love to win. I have 4 children with celiac disease. Hi Darcy–Welcome to gfe! 🙂 Yes, the book would be a great resource for your family and the goodies would be enjoyed by your four children. Best of luck! I would like to win this prize because I’m interested in trying more products that are gluten free, so I can make the switch. I would like to win this giveaway because I have celiac disease and my whole family eats gluten free. This book would be great to help me explain to my 2 yr old why we all have to eat gluten-free! All the products would also be fantastic to save us a little money!! Thank you! Hi Amo–It’s so good to see you here at gfe again! 🙂 I think this would definitely be a terrific book for your 2-year old and yes, you’d enjoy the products very much, too. 😉 Thanks for so many entries … good luck, dear! I “Like” Mommy what is Celiac, on Facebook. I would love to win this giveaway because I have lots of Gluten Free friends to share with this holiday season! I have become a fan on facebook and shared some info there…I am really happy with info I found today…Pumkin Martini? Cornn chip stuffing! Awesome!!! I would love to win as I am in a new area an dunsure what some of my options are for GF dining and there is still always the food and ingredients dilemma. Hi Susan–Welcome to gfe and thanks so much for all the kind words! 🙂 I know you’d love this package … good luck to you! Hi Erin–Nice to meet you here at gfe. 🙂 Katie’s book is a lovely, easy-to-understand explanation on celiac for anyone. I’d like to win because if have a child on a GF diet. I’ve got two gf kids and would love to share the book and assorted resources with them. Thanks! Hi Morah–Welcome! It’s nice to have you here at gfe. 🙂 This giveaway package would be lovely for your kids … best of luck! I would like to win this package because I have five year old twins girls with Celiac Disease. They just started Kindergarten a few months ago and already we have dealt with difficult situations concerning food and art supplies. I think this book would help them to better understand why they need to avoid gluten and it could even help their teachers to better understand it to! Hi Janet–It looks like you are new here–welcome to gfe! 🙂 I’m not surprised on the challenges your girls have faced at school. They can seem overwhelming. I think it gets easier over time, even with children, as they learn to look out for themselves, educating others in the process. Katie’s book would be excellent for your girls, their teachers, and family members, too. Hi Melanie–Welcome to gfe! 🙂 One entry is all you need, don’t get overwhelmed by all the possible options. 😉 Thanks for the connections though! Start out with your new gluten-free diet by considering all your favorite foods that are naturally gluten free from real food like meat, seafood, fruit, veggies, and most dairy to mainstream processed foods that are gluten free, with just a few gf specialty products in the mix. That’s the gfe approach and the easiest, most economical, and healthiest way to eat gluten free in my opinion. Look on the sidebar under “gfe’s tip sheets” for 50 Foods You Can Eat Today as a starting point (not all foods you’d want to eat daily, but it’s a transitional thing) and 50 Meals That Are GFE. The latter will get you thinking about all the foods and meals you already eat that are gluten free. A couple more points … I don’t choose the winners, random.org does that for me. 😉 And, I do recommend that you get tested for celiac before going gluten free. Once one goes gluten free, celiac testing will be inaccurate. Finding out that one has celiac disease can be important for medical personnel knowing how to treat you and taking your condition seriously, and for you as far as having the conviction to stay gluten free. Maybe your cousins can direct you to a doctor for celiac testing. A negative test doesn’t rule out a serious non-celiac issue, but it is a hoop that most advise jumping through. Hi jill–Welcome to gfe. 🙂 This would be a lovely package to share with your granddaughter! I liked “Gluten free easily” on facebook since I just started taking it out of my 3 year old daughter’s diet this week and already see changes! I want so badly for her to get better and need all the help I can get and would love to win any products that might help us out! Hi Angela–It looks like you are new to gfe–welcome! 🙂 That’s awesome that you are seeing improvements with your daughter already! Please take a look around gfe at the tips sheets on the sidebar and the recipes page, where there are tons of super easy meal and dessert ideas. I would love this gift package. I’d send some of the snacks to my daughter in college, who has celiac and has a hard time finding snacks that are GF. The rest would go to my daughter and grandson-who also have celiac. What a gift! Never seen such an awesome gift that would be more perfect for someone with celiac. Awesome! I would like to win this give away, because my son was just diagnosed with celiac. I think having a book to help explain this, and goodies to try alternatives to his favorite snacks that we have not been able to try yet. Hi Patti–Hope you’ll take a look around gfe–welcome! 🙂 There’s very helpful info for those who are newly diagnosed on my sidebar and many easy recipes that taste just like normal food on my Recipe page. I am trying to cook for a sick friend who is gluten intolerant. I NEED help. The products would be great. I’d give the book to my local library so many children can be helped. Hi Linda–Sounds like you have a good plan if you win! 🙂 Thanks so much for entering the giveaway. Since you are taking care of a sick gluten-intolerant friend (thank you for that), be sure to look at the tip sheets on the side bar, which will give you menu ideas and on the recipe page for easy, delicious gfe recipes. What a wonderful package of incredible gluten free items and an amazing book! We already have a copy (and did a review on our site) but would love to win the other items or give the book to one of the many deserving celiacs we know! I liked and friended you on facebook. I love your blog, recently gone gluten free and have been finding so many store bought GF products expensive and recipes complicated. Your idea and philosophy being gluten free eiasly is exactly what I needed. Thank you, You have helped so much! I would love to win this giveaway. My 10 year old was recently diagnosed and I’m sure many of are will be following suite. I must admit, a diagnosis before the holidays has been overwhelming. We’re trying to adjust to this new life. Birthday parties, camp, club meetings, holidays, and social function planning is SO difficult for me and on a very small food budget it’s been high stress this holiday season! I would like to show this book to my grandkids. It would help explain why Gramma can’t eat everything that they do. It’s funny that they used to ask every time “Is this GF?” before they would eat anything. But now they can’t tell. Thank you for the wonderful opportunity. I would love to be able to win this prize as being a single parent of a gluten free household can be expensive at times. This would really help us out. Plus what a wonderful book to read to my son to explain why we do not eat things others do. Would love to win this giveaway because i’d really like to win the book for my niece. The GF foods for her would be excellent too! I would like to win – looks great! I’m so happy to have won this contest. I am just as happy to have found Shirley and her great blog. The advice that you offer helps us out in so many ways. You are such a blessing to those of us with this disease. To have someone to be able to go to with all of our questions is really truly amazing. Thank you again, Shirley.